View interactive map and get custom driving directions. Click the image to view a simple map. Take MD 295 South (Balto/Wash Pkwy) OR I-95 South to Rt. 32 East/Ft Meade. Move to right lane and exit onto Canine Road (Exit 10A) immediately after 295 North. Turn left at the light onto Colony Seven Road. Follow the road through the construction past the large parking lot alongside Rt. 32 West into museum parking lot. Take MD 295 North (Balto/Wash Pkwy) OR I-95 North to Rt. 32 East/Ft Meade. Exit onto Canine Road (Exit 10A). Follow the road through the construction past the first large parking lot alongside Rt. 32 West into museum parking lot. 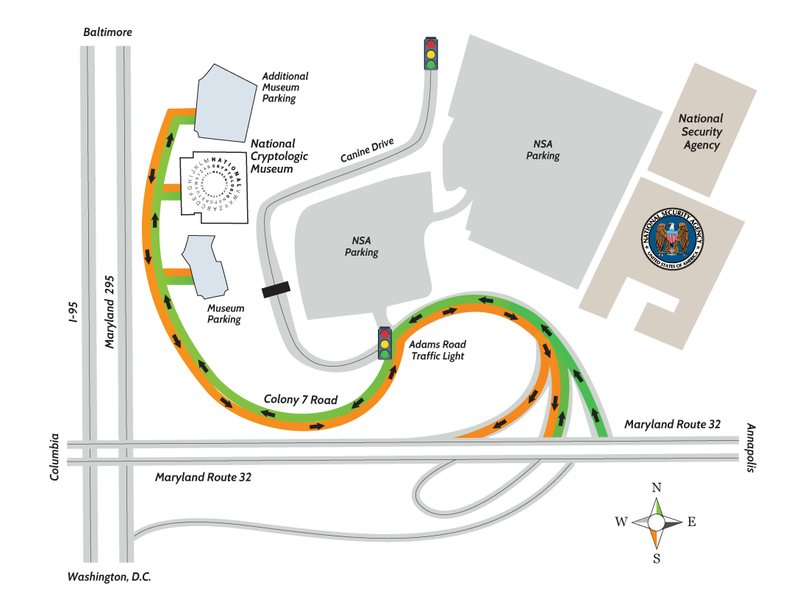 Move to right lane and exit onto Canine Road (Exit 10A) immediately after MD 295 North (Balto/Wash Pkwy). Take Rt. 32 West and bear right onto Canine Road (Exit 10A). Follow the road past the construction past the large parking lot alongside Rt. 32 West into museum parking lot. Follow Colony Seven Road to light. Turn right onto Canine Road. To go north on Canine Road bear right onto entrance ramp for Rt. 32 West. Immediately exit onto MD 295 North (Balto/Wash Pkwy) or continue on Rt. 32 West to the I-95N exit. To go south on Canine Road bear right onto entrance ramp for Rt. 32 West. Take second exit onto MD 295 South (Balto/Wash Pkwy) or stay on 32 West to the I-95S exit. To go east on Canine Road bear left onto entrance ramp for 32 East. Follow bend around to merge onto 32 East. To go west on Canine Road bear right onto entrance ramp for Rt. 32 West.